A huge thank you to Adobe and everyone who showed up for the Networking Draft event last Friday. We had a great time playing with you and hope that you were able to make some good contacts. We look forward to doing similar events with Adobe in the future. This weekend, we have some really great community events that we will be participating with. First off, we will be hosting a Board Game Day for a local Board Game Group. There will be a $5 entry fee for this event. Here is what they have planned for their events on November 11th starting at 12:00pm. This will be a bring your own games event but we do have a game library, and you are welcome to play any of those in the Demo section. We will run from 12:00 pm to 10:00 pm. You are welcome to come and go anytime though. The fee will cover one snack, or drink, and prizes such as play to win and raffles. Play to win games with others to be raffled and gift cards. The more people that attend the more cool stuff there will be. So spread the word. There is maximum of 42 attendance spots, so pre-register today. This will ensure you will get a spot before 6:30pm. If you don't show up by that time, you will lose your "saved spot" though you will still be able to attend. The raffle will be held at 6:30. Everyone who attends this event will receive a 5% discount or you can sign up for the Gamer's Club get 10% off every time you shop at Gamer's Inn. Children should be at least 10 years old to participate. We look forward to hosting this event and hope that many of you can come join us. It is always fun to find new people to play games with. You can register online for this event here. Then, we will be participating a the Remax Balloon Bash. This will be held at Shay Park in Saratoga Springs on November 11th from 9am to 2pm. There will be food trucks, balloon rides and of course, Gamer's Inn! We will be doing a drawing that day so make sure to come visit us for your chance to enter and win. It is just about time for MTG Iconic Masters to release. We will be hosting a draft for Iconic Masters draft to celebrate the release on Friday, November 17th at 7:30pm. There is a $27 entry fee, which can be paid in store or online here. There will be limited spots for this event so make sure to sign up soon. For those that preordered a box, they will be available for pick up on Friday, November 17th. Individual boosters will also be available at that time. Come join us November 18th at Gamer’s Inn for the 2017 Fall WizKids Open for Dice Masters! We will be using a Rainbow Draft format for this event and will be drafting Guardians of the Galaxy. The cost to participate is only $14.00 a person. 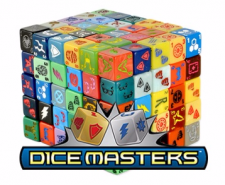 The winner of the event earns a 2017-2018 Dice Masters National Championship Qualification. Play amazing games, win exclusive prizes, and support your local game store at one of the biggest WizKids gaming events of the year! Tomb of Annihilation features multiple scenarios, challenging quests and game play designed for a single player or a cooperative group of 2-5 players. 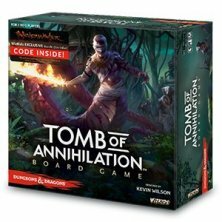 Tomb of Annihilation can also be combined with the other D&D Adventure System Cooperative Play Board Games. You may have seen us talking in the emails recently about being able to do more things on our website. We are immensely pleased with the response that we have had about our new website. It has been wonderful to be able to provide the ability for you to be able to see what products we have available, be able to sign up for our different classes and to be able to preorder different products. Remember that beyond our website, you can also follow us on Facebook and Twitter for updates and reminders about events. Mark your calendars for our upcoming Game Nights and other events. 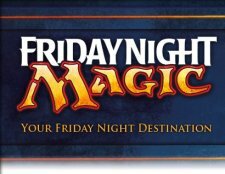 Each Game Night starts at 7:00pm and is free to participate in.